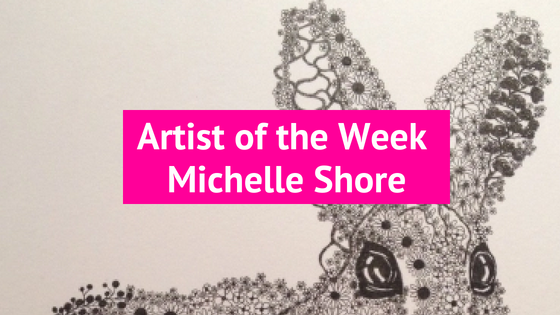 PopUp Painting’s ‘artist of the week’ is PopUp Painting team member and artist Michelle Shore. Michelle Shore is an artist based in The Peak District, who works as part of the Manchester PopUp Painting team. The artist specialises in ink drawings, however she also uses charcoal, pastel and paint to create her work. Michelle is currently studying BA(Hons) in Illustration and Animation at Manchester Metropolitan University. The artist is inspired by stories, songs, nature, animals and by the Peak District where she lives. Much of Michelle Shore’s work is figurative and often features animals, using bold and precise lines to create her pieces. The bold lines and contrast of the black and white works are reminiscent of Japanese wood cuts. You can follow Michelle’s Facebook page here and find the artist on Instagram at michelleshoreillustration. The artist also sells her work at both https://michelleshoreillustration.co.uk/ and https://society6.com/michelleshoreillustration.